Failed Missile Test May Make North Korea More Belligerent : The Two-Way The disintegration of North Korea's latest long-range missile shortly after liftoff today increases the likelihood that the communist nation will resume testing nuclear weapons or take other provocative steps to show its strength, analysts say. Prior to today's launch, a North Korean soldier stood guard. The disintegration of North Korea's latest long-range missile shortly after liftoff today may just make that communist nation even more belligerent and more likely to test a nuclear weapon or take other provocative actions, NPR's Louisa Lim reports from Seoul. 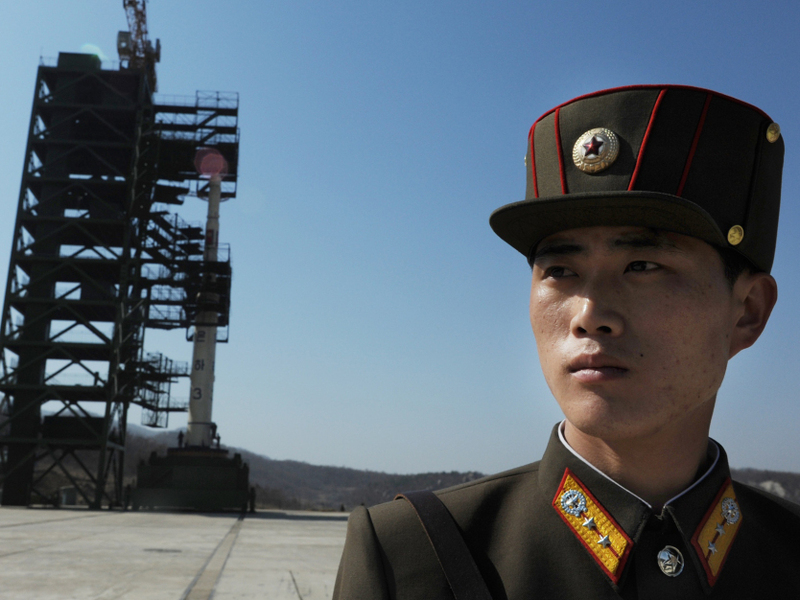 On Morning Edition, Louisa reported that because the rocket's failure is perhaps the most embarrassing moment in the North's history, new leader Kim Jong Un and others in the hierarchy will likely be looking for other ways to show their strength. "In South Korea," Louisa says, "a defense ministry official warned parliament that the possibility of a nuclear test – North Korea's third — or of other provocations is very high. And Peter Beck from the Asia Foundation in Seoul agrees that this failure is likely to make Pyongyang more belligerent." North Korea must prove to the world "that it can move forward unimpeded despite this failure," Beck says. "I think we're entering into a new era of provocation by the North because it's been so embarrassed in front of the international community." Rory Medcalf, program director of international security at the Lowy Institute, agrees, telling CNN that "I wouldn't exaggerate it, but the chance of a nuclear test this year is now higher than it was yesterday." The level of embarrassment felt today by North Korea's leaders was underscored, Louisa reports, by the quickness with which the failure was acknowledged. Within just a few hours after the liftoff and breaking up of the rocket, a grim-faced announcer appeared on North Korea television to say that it had failed to enter orbit. According to Louisa, that was an "unprecedented moment of honesty." When the previous two such launches also ended in failure, officials just lied about what happened. But having invited the international press in, such a pretense was impossible this time. As South Korea's Yonhap News Agency reports, "the Unha-3 rocket exploded in just one to two minutes after lift-off at 7:39 a.m. [local time] and disintegrated into about 20 pieces as it crashed into international waters off South Korea's west coast, according to South Korea's Defense Ministry." The U.S., Japan and other nations, including Russia, were quick to condemn North Korea's decision to fire the missile. They had called for the North to suspend any such action. The New York Times adds that "the United Nations Security Council scheduled an emergency meeting for later Friday, and American officials said food aid that they had planned to send to North Korea to help feed its malnourished population would be suspended."